McCloskey International offers a full line of track crushers including; jaw, cone, horizontal shaft impact, and vertical shaft impact crushers. The "J" series jaw crushers offer a range of sizes for various applications, from high production, contractor-friendly entry models to the range-topping J50, which has the widest jaw in its class. 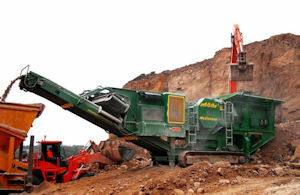 Both the "C" class cone crushers and "I" class impactors are available with recirculating systems, allowing operators to produce a high-quality product with one machine. The "V" series offers some of the most efficient vertical shaft impact crushers on the market, producing high specification fine products. Adding to the mobility of McCloskey crushers is the availability of wheeled bogie systems that eliminate the need for a trailer. 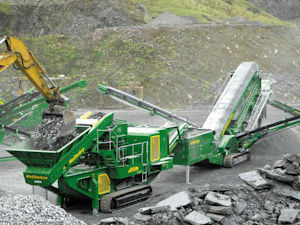 McCloskey's vibrating screeners are all built around the industry leading High Energy Screenbox. 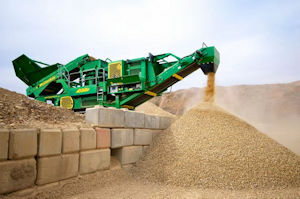 The High Energy Screenbox maximizes vibratory power with a longer stroke and heavy-duty eccentrics, applying more energy to material in the screenbox to accelerate throughout. 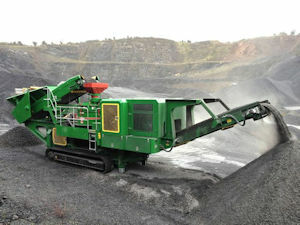 McCloskey International has manufactured a range of screens that are designed to give customers high output and durability in the harshest of conditions. With a wide range of flat-deck screeners available, McCloskey is sure to offer a machine to best suit your application and requirements. With the Heavy Duty R-range, the High Energy S-range for finer applications, and the highly versatile Kompaq and Sizers, McCloskey flat-decks can handle any application from on-site construction and demolition, to large aggregates and quarry applications. McCloskey stackers have a unique and patented counterweight system and are designed to be the most practical solution on the market. With features such as the pivoting discharge conveyor, McCloskey stackers can swivel through a radius of 180 degrees, ensuring greater stockpile capacity without moving the installation, equaling less downtime for operators. A full line of tracked stackers allows operators to easily and efficiently move the stackers into position.